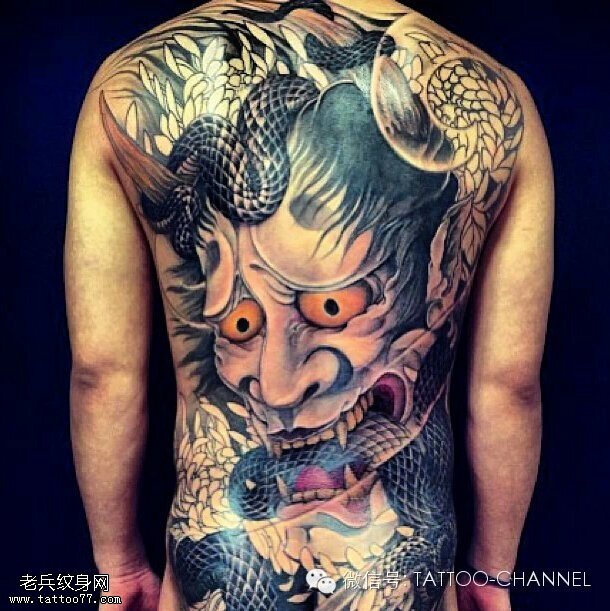 According to the Japan Tattoo Association, there are only 300 irezumi artists in Japan. 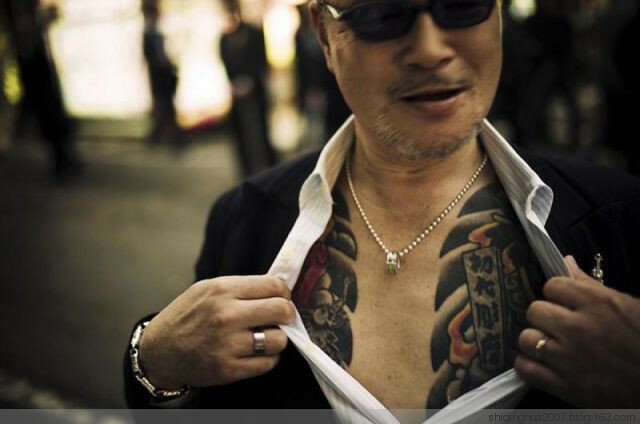 In 2012, the mayor of Osaka city started a campaign to fire the officials who had tattoos. 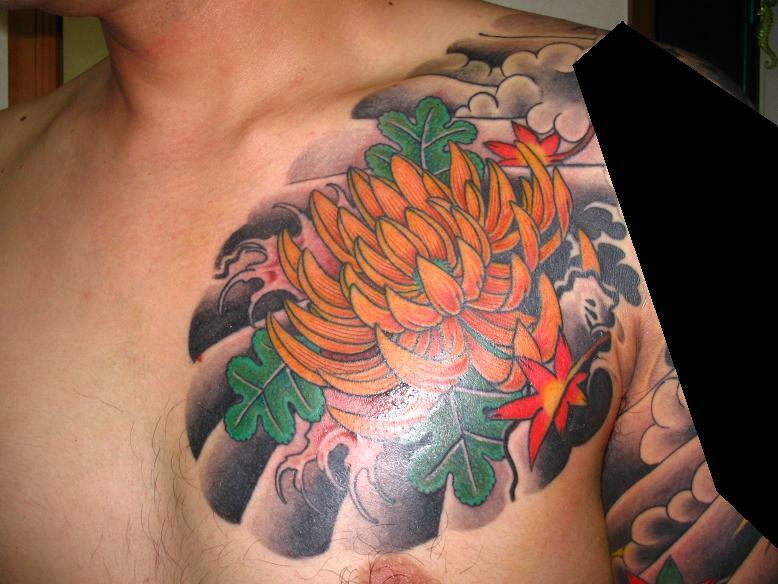 This kind of discrimination must discourage many tattooist to continue this Japanese tradition. 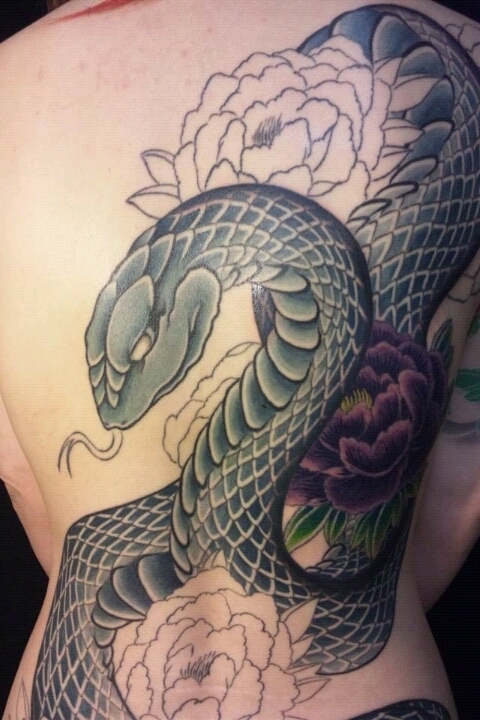 I will talk about irezumi-shi (入れ墨師/ tattosit) in another article. 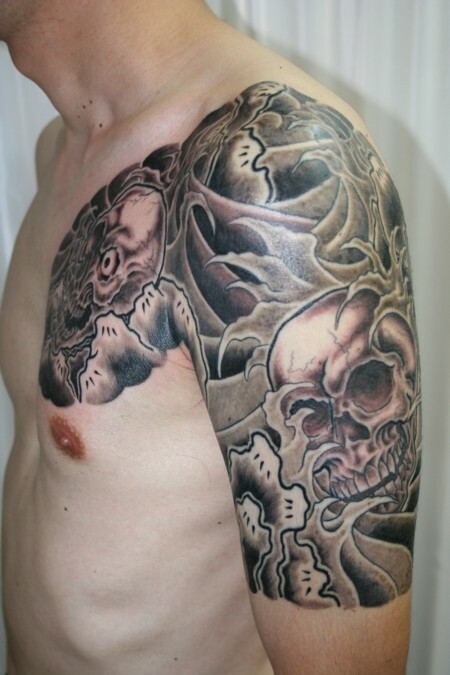 Today, I like to see the meaning of Japanese tattoo designs. This beautiful art work should have meanings or at least symbolising something. Yes, they are. Japanese people believed dragon is originated from Japan and as it evolved, dragon increased its nails. However, Chinese and Korean people believed that as it evolved, dragon lost its nails. As well as other Asian countries, dragon in Japan is considered to be related to the water and the rain. Dragon is not a symbol of fire, power or wealth as it´s often considered in Europe. Especially in Japan, dragon is a symbol of generosity, wisdom and strength. 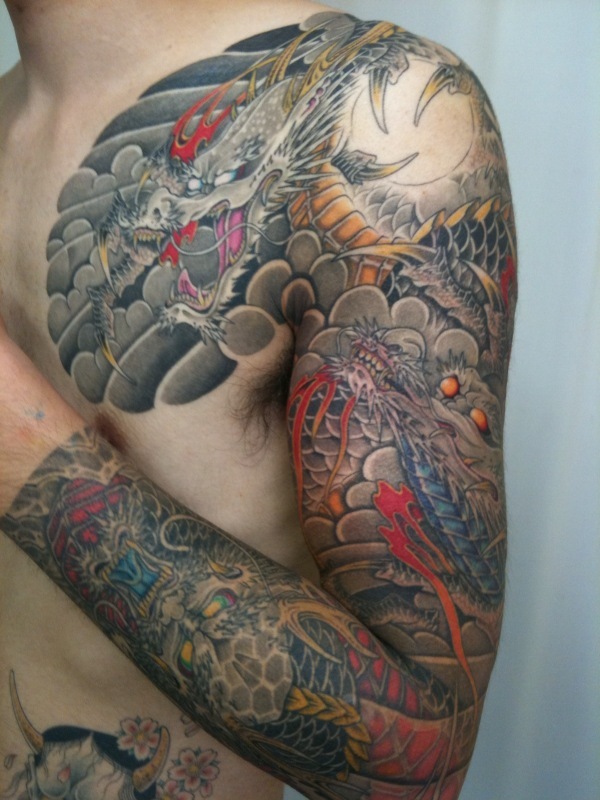 Dragon is one of the most popular design for irezumi. 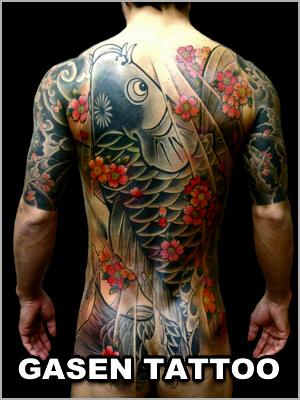 Another popular design among Japanese tattoo is carp. In the oriental culture, carp is a symbol of strength and courage. In the Chinese folklore, koi fish swim up the Yellow River but only a few can reach ryumon (竜門/ Longmen or dragon gate). It´s believed that the carps which pass this point become a dragon. From this belief, carp is also a symbol of determination, desire to achieve your dream and to become better. As we know, phoenix became ash in flames and revived. The symbol of phoenix is revival and victory. 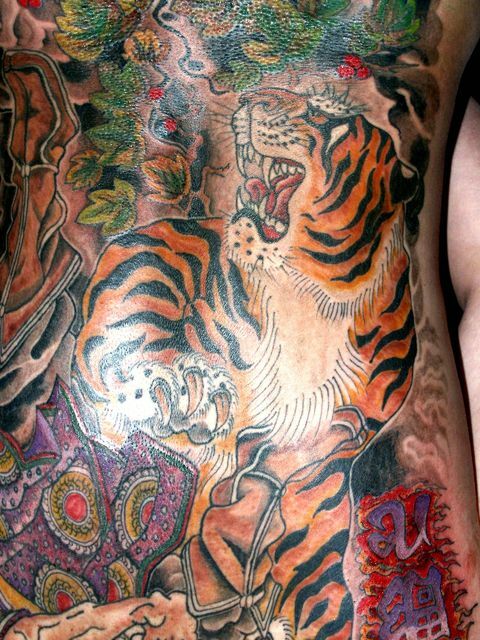 Tiger is another design represents strength and courage. It´s believed that tiger controls the wind and is often chosen for the protection from the bad luck, bad spirits and illnesses. 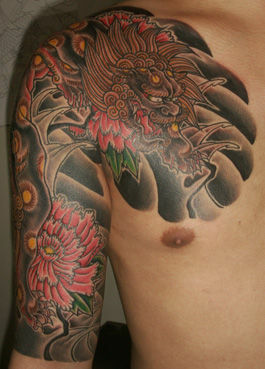 Japanese lion design has pointed triangular shape and it looks both lion or komainu, the guardian dogs of shrines. This is a symbol of strength and power. Also it´s used for the protection. Those who have a desire to be a hero tend to choose this design. Snake has a symbol of many things. First it is a guardian and protects you from disasters, misfortunes and illnesses. Secondary, it´s a symbol of wisdom and protects you from the bad result of your decision. Since snakes moult, it´s related to cure and revival. Moulting is also a symbol of the power of men and the sacredness of women. Unlike the dark meaning of death, danger and unlucky, which is how people consider in the Western society, Japanese people seem to have a positive image towards the skull. It´s a natural circulation of life, which implies a change. The meaning is of course different depends on the flower but any flower design is highly appreciated in Japan. Lotus (Hasu/ 蓮): Comprehension, wisdom, enlightenment and life. Cherry blossoms (Sakura/桜): The life of this flower is very short and Japanese people tend to consider it as a reflection of their own inevitable death. Chrysanthemum (Kiku/菊): This is the symbol of the Emperor. It´s the image of perfection, sometimes God, then happiness, delight and long life. Rose (Bara/バラ): Balance, eternal love or new start. Rose with thorns: Loss, defense, unthoughtful. Peony (Shakuyaku/芍薬): This is the king of flower and is a symbol of elegance and wealth. Orchid (Ran/蘭): Courage, power and strength. Ogre is the most common tattoo design in Japan. People who have ogre tend to believe the spiritual world where ogres are responsible for punishing injustice and evilness. Usually ogres are the symbol of evilness but good ogres are the symbol of protection. How about hannya masks? Can u please give me some idea about the meaning if it. Thank u so much for the info sir! Interesting article. I have always wanted to have a pair of matched Shi shi on either arm, but I was involved in a traditional Japanese martial art and felt that tattoos would be considered disrespectful. Now that my studies are solitary, I may just go ahead and have them done! What is the difference between the terms “Shi Shi” and “Komainu?” I haven’t found an explanation that was clear on the difference. I have also noticed that most paired shi-shi have two types: One with the mouth open and one with th3e mouth closed. One has it’s foot on a child Shi-shi, while the other has it’s foot on a ball. Do they have the same name? Thank you for your comment, Gary san. The difference between Shi-shi and Komainu sounds like an interesting theme for iromegane. Please give me some time to investigate. The one with the mouth open is the male and his mouth is open to let evil out, the one with the mouth closed is the female to keep evil out.